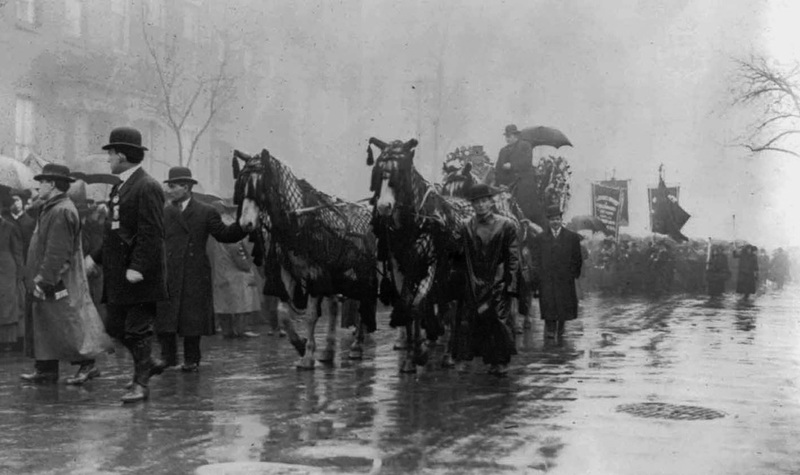 Funeral procession for the victims of the Triangle Factory Fire. 1911. On March 25, 1911, fire spread through the cramped Triangle Waist Company garment factory on the 8th, 9th and 10th floors of the Asch Building in lower Manhattan. Workers in the factory, many of whom were young women recently arrived from Europe, had little time or opportunity to escape. The rapidly spreading fire killed 146 workers. The building had only one fire escape, which collapsed during the rescue effort. Long tables and bulky machines trapped many of the victims. Panicked workers were crushed as they struggled with doors that were locked by managers to prevent theft, or doors that opened the wrong way. Only a few buckets of water were on hand to douse the flames. Outside, firefighters’ ladders were too short to reach the top floors and ineffective safety nets ripped like paper. The catastrophe sent shockwaves through the city, beginning in the communities of immigrant workers on Manhattan’s Lower East Side, where families struggled to identify their lost in makeshift morgues. Family grief turned to citizen anger as the causes of the fire – including the abhorrent working conditions at the time – were exposed. The public outcry over what was clearly a preventable tragedy brought a renewed sense of urgency to the labor movement and to other groups working to improve women’s and immigrants’ rights in the workplace. Frances Perkins, who became the Secretary of Labor under President Franklin D. Roosevelt, witnessed the horror from Washington Park, recalling later that what she saw convinced her that “…something must be done. We’ve got to turn this into some kind of victory, some kind of constructive action.” Perkins and other leaders with direct experience of the Triangle fire, like New York Governor Al Smith, soon helped marshal new workplace safety standards into law in the State of New York, setting an example for the rest of the country. 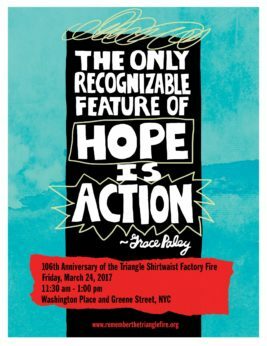 Flyer for the March 24th, 2017 commemoration of the Triangle fire. On Friday, March 24th, we will gather to remember the 146 lives lost 106 years ago. We will gather together to recommit to the fight to protect all workers, because we are activists, and activists stand up for each other. Whether your workplace is a garment factory, a non-union construction site, a nail salon, a classroom or anywhere in between, let us remember the lessons of the Triangle Shirtwaist Factory fire. Worker protection cannot be passive. Worker protection takes action, and we must stand together as a movement that relies on determination, solidarity, and hope for a better future. Each year, we gather to remember the 146 workers who lost their lives in the tragic blaze, and to recommit to fighting for workers’ rights. This year’s program will also highlight two industries where worker abuses are rampant: Farm work and construction. Speakers at the 100th anniversary commemoration said such horrifying working conditions still exist, in the U.S. and worldwide. They cited such disasters as a 1991 poultry plant fire in Hamlet, N.C. – the doors were locked, again – the Texas City, Texas BP oil refinery blast in 2005 (15 dead, 180 injured), last year’s Gulf of Mexico disaster (11 died) and the Upper Big Branch coal mine explosion in West Virginia (29 died). Bangladesh was the international example. The exploiters are the same, they said: Firms that put profits ahead of people. The predominant victims of such disasters are, still, those who are the most defenseless: The young, women, minorities and, importantly, non-unionized. They’re unprotected. 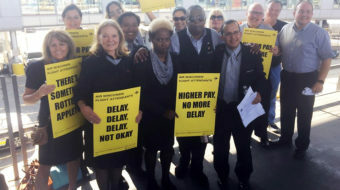 And they said workers and their allies must seize a present teachable moment – the Right Wing campaign to obliterate workers’ rights – to both re-energize the labor movement and to enlist allies and the general public.